Over the last 90 days of available statistics, popular multi-network sharing service AddThis shows few surprises in its top services selected by customers. Facebook dominates all options with nearly 40 percent of all shares, with Twitter and e-mail having just under ten percent apiece. But further down the chart, while most services saw single digit moves, up or down, two Google services are seeing significant growth - with Gmail logging an increase of 76%, and its companion network, Google Buzz, spiking, up 296% from the previous 90 day period. Sharing from AddThis to Buzz was good enough for #22 overall, just ahead of others including LinkedIn, Tumblr and Wordpress. It's tempting to write off the blip as nothing more than a blip - a rule of small numbers. After all, the total percentage of shares to Google Buzz from AddThis totaled .25%, or 1 of every 400 shares. The top 10 services, comprising of Facebook, Twitter, Email, Print, Google, MySpace, Favorites, StumbleUpon, Messenger and Delicious, comprise more than 85% of all shares, leaving scraps for the remaining services - and one knows Google services aren't supposed to be "also rans" outside the top ten in most cases. To dig deeper into the surprising data, I asked AddThis for more clarification. 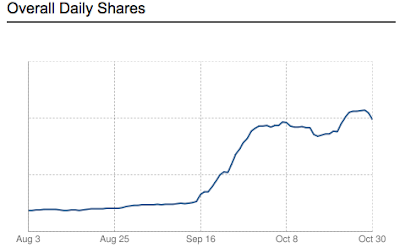 While the company doesn't yet expose absolute sharing statistics, they reported that the rise in both Google Buzz and its companion Gmail is likely a recovery after a slow summer. 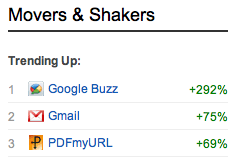 The spike in Buzz propels it to the 5th most popular social network overall. "Kids are back in school and sharing up a storm," wrote Justin Thorp, Community Manager for AddThis. "But... even with that, Gmail & Google Buzz are still seeing growth, usage, and excitement." Aside from the 3-month bump, Thorp reports that StumbleUpon "has been the one that's seen some of the most continuous" growth. Additional AddThis details on Google Buzz reveal that after the United States, which leads by a large margin, the next most active countries sharing to Buzz via AddThis are the Netherlands, India, Russia, Brazil, Germany, China, Canada, the UK, and France. In contrast, the long since purchased, but still active, FriendFeed statistics show Turkey far outpacing the United States, followed by Italy, India and Pakistan. While the world awaits Google's next round of social updates, long rumored, but still unclear, the loyal Buzz community eagerly awaits any signs of good news that show engagement and activity in the much-dismissed social sharing network. AddThis' statistics give a glimmer of hope, even if it is small numbers relative to other social tech titans.